Brisley first achieved notoriety in the 1960s and ’70s and is perhaps best-known for his disturbing physical performances, but his work as an artist extends over four decades and has also embraced painting, print, sculpture and installation, films and fictions, and large-scale participatory projects. At the centre of this diverse work lies his exploration of the essential qualities of what it means to be human – he has challenged the human body in physical, psychological and emotional ways. In his performance work, Brisley engages the audience and establishes a dialogue of action and reaction that induces a release from conventions of social behaviour. He has also examined the body politic and images of power; his paintings, prints and sculpture have expressed a literary and symbolic approach to power as represented in the media. 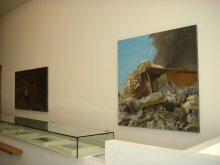 This retrospective view of Brisley’s work focuses primarily on his paintings. 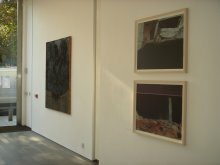 It includes the collaged and constructed paintings produced in London and Munich in the late 1950s and early ’60s, works that explored the notion of a painting as an object connected to both body and ground, as well as Brisley’s fascination with the qualities of matter and the use of debris such as fragments of corrugated iron decayed by rust. His recent paintings continue this interest in the accumulation of the discarded, stemming from his long study of the human body and engagement with material as subject. 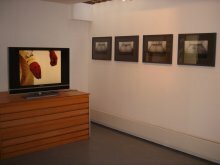 The exhibition incorporates films, sculpture, photographic works and painting. 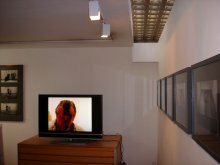 A selection of Brisley’s films, and films of his performances in Europe and Britain, will form a significant part of the exhibition. 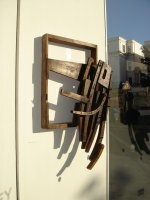 The artist has made this the occasion for the first screenings of The Leg and Sweating the Hole. Other screenings include Ten Days (video by Ken McMullen) and Arbeit Macht Frei. 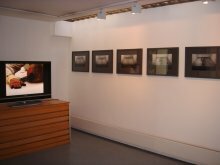 A series of period photo sequence works relate to his performance works from the late 1960s to the present focusing on his links with Europe.